TransMessis Columbia Plateau LLC, a wholly owned subsidiary of TransMessis Renewable Energy Inc., has closed an approximately $6 million restructuring of the integrated canola crushing and biodiesel production operation in Odessa, Wash.
Biodiesel producer and marketer Renewable Energy Group Inc. has entered into an agreement with Dutch Hill Terminals, a leading heating oil terminal in New Jersey, to market biodiesel and biodiesel blended heating oil at its Clifton, N.J., location. Patriot Renewable Fuels, a 120 MMgy ethanol plant in Annawan, Ill., will be installing a new supercritical biodiesel processing unit from Miamisburg, Ohio-based Jatrodiesel to convert its distillers corn oil into 5 MMgy of biodiesel. Academic testing has verified OriginOil's new Algae Screen growth optimizer effectively controls bacteria and microscopic predators in commercial algae production, helping to promote high rates of cultivation of the most valuable species. Following U.S. EPA's Nov. 15 announcement that the agency proposes scaling back the renewable fuel standard (RFS) volumes next year, stock values surged for four of the "Big Five" oil companies, representing a $23 billion windfall in just one day. 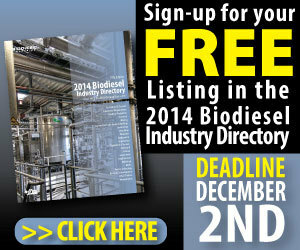 As of Nov. 27, the EU will impose definitive antidumping duties on imports of biodiesel from Argentina and Indonesia. The antidumping measures consist of an additional duty of on average 24.6 percent for Argentina and 18.9 percent for Indonesia. National Biodiesel Board members selected their association leadership as part of the organization's membership meeting in Washington, D.C., this month. Members voted to fill eight positions on the 15-person board and new officers were elected.